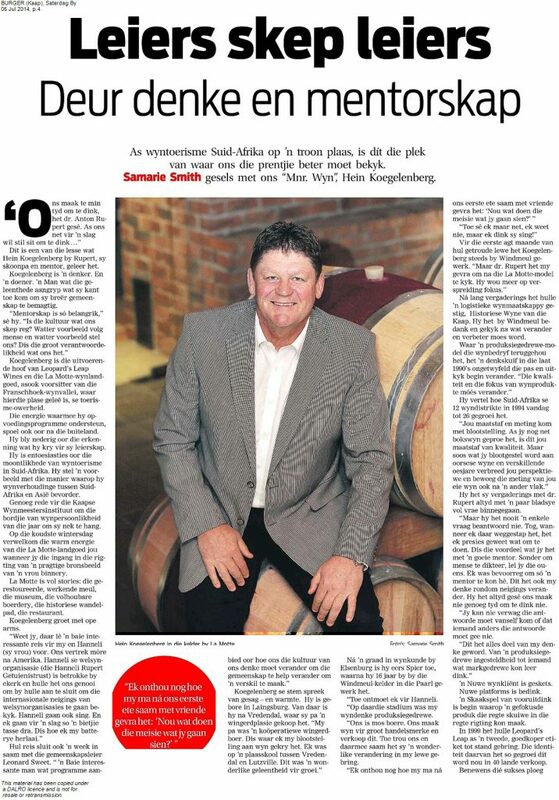 Last week I chatted to Samarie Smith of Die Burger, the Afrikaans daily in the Western Cape. If wine tourism puts South Africa on a throne, then thís is the ideal point from which to view the picture. Samarie Smith talks to our “Mr. Wine”, Hein Koegelenberg. Hein Koegelenberg is a thinker. And a doer. A man who grasps opportunities to empower the broader community. Koegelenberg is the CEO of Leopard’s Leap Wines and La Motte Wine Estate, as well as Chairman of Franschhoek Wine Valley Tourism, the Valley being the area where these farms are situated. The energy with which he supports and drives educational programmes is felt far beyond South Africa’s borders. He remains humble about all the leadership-related feathers in his cap. He shows great enthusiasm for the wine tourism potential of our country. And he sets an inspiring example in the way he promotes wine relationships between South Africa and Asia. Enough reason for the Institute of Cape Wine Masters to have crowned him as Wine Personality of the Year. On the coldest winter’s day one is welcomed by the warm energy of La Motte as you drive into the estate in the direction of an impressive bronze sculpture of a woman – the symbolic Wine Bearer. La Motte has many facets: its Pierneef à La Motte restaurant, its own museum, biological farming, a historic hiking trail, a renovated 18th-century water mill, still in a working condition. Koegelenberg extends a welcome with open arms. Their trip will include a week in the company of community leader Leonard Sweet. Koegelenberg’s voice carries authority – and warmth. He was born in Laingsburg. From there, he moved to Vredendal, where his father bought a small wine-farm. After obtaining his qualification in Viniculture at Elsenburg Agricultural College, Hein spent sixteen years working at Spier Wine Farm near Stellenbosch before joining Windmeul Winery in the Paarl area. “At that stage my thinking in terms of wine was production-driven. After all, we were farmers. We produced wine for well-known brands and sold it. Then we got married … and Hanneli changed my life in a wonderful way. During the first eight months of married life Koegelenberg still worked at Windmeul Winery. After lengthy meetings they founded a logistic wine company – Historic Wines of the Cape. Hein resigned at Windmeul and looked at what had to be changed and improved when it comes to wine logistics. Where a production driven model held back the wine industry, fresh thinking during the late 90s undoubtedly started changing the pace and the viewpoint. “Quality and the focus of wine products simply had to change”, Koegelenberg puts it, and explains how the 12 wine districts in South Africa in 1994 have grown to 26 today. He always entered his meetings with Dr. Rupert with a few pages of questions in his hand. A new wine client was defined. New platforms were considered. A game of chess was launched by which a focused product had to make the correct moves in the right direction. In 1999 the Leopard’s Leap brand was introduced as a second, more affordable label. The identity of this label grew to such an extent that Leopard’s Leap wines are now sold in 40 countries. Over and above this success, Leopard’s Leap now makes a worthy contribution to conservation, with its active involvement in the protection of the Cape Mountain Leopard. “I cannot make a better wine than you. It is all just perception. Yes, there are price restrictions and quality categories, but you have to have a focus. “The French succeeded. If I say Pétrus, then you know it is St. Emillion. If I say Lafite, then you know I’m talking about Bordeaux. They became known for something. “In South Africa we did things well, but we weren’t well-known for anything. “These days we do have a focus – think of Meerlust (Rubicon), Kanonkop (Paul Sauer) or Hamilton Russell (Chardonnay)”, he mentions a few examples. La Motte developed the same focus, with Sauvignon Blanc and Shiraz, and elevated these varieties to an international level. La Motte even made its own Rhône wine in France – only a single barrel, though – and labelled it Three Stakes. “Robert Mondavi changed perceptions, challenging the French in a wine-tasting in Paris. They thought his wine would hit the bottom of the list. Surprisingly, his wine ended up in the middle amongst the top French names. Mondavi was also the first wine giant who said that product alone was not enough. He started organising music, art and wine festivals, combined food with wine, created stories around a product and established this culture on a world-wide scale. “So, apart from stories, we must create wine experiences, in order to attract tourists. With our Pierneef à La Motte Restaurant, for instance, we have researched and documented 150 regional food recipes that were published in a cookbook and we also offer visitors an unusual food experience. At Leopard’s Leap, again, a totally different experience is offered. One absorbs Koegelenberg’s own story together with other facets of the visit to La Motte. He is quite correct … in any restaurant the wine-list ends up in the hands of the most experienced wine-drinker at the table. Everybody shies away from making the wine choice, while all that’s needed is a good story about the wine. La Motte is a wine tourism champion, as selected in the annual competition presented by the Great Wine Capitals of the World network, of which South Africa is part. Social networks have given wings to brands and boosted the opportunities for wines. Trends and platforms change at such a pace that you have to keep your ears close to the ground … sometimes even in foreign territory. “When the American market collapsed, ten years ago, it was a good time to investigate other avenues, and China was a massive opportunity. At that stage, nobody from here really sold wine to China. We immediately approached the most successful distribution networks and sold our wines through platforms that were already in place. James Tan, a Malaysian-Chinese, was appointed and a start was made in developing the market: Vietnam, Malaysia, Singapore, Taiwan, China, Japan. With Asians it is important to build relationships and, during his negotiations, sometimes on the golf course, Koegelenberg met businessman Mr. Woo Swee Lian, CEO of Perfect China (a company that recently made an investment in Val de Vie Cellar and Vineyards). The company Perfect Wines of South Africa was founded, with a Chinese trade-mark L’Huguenot. During 2012 a total of 2,8 million bottles were exported to China. L’Huguenot wines are sold on an incentive basis. Sales people who reach a certain target, qualify for a special wine tourism experience in South Africa. A Franschhoek Tourism Guide was also translated into Mandarin and 65 000 copies were distributed to tourism offices in China.